It has been several years since our first time stepping foot through Sushi Noguchi's doors but the memory and knowledge of how good food is there outlasts the years. We have visited on multiple occasions, and as more and more people learn about it, we see more and more photos posted of the restaurant's beautifully-arranged plates as our friends indulge in fresh sushi. We went back this month to see what would grace the menu that evening. 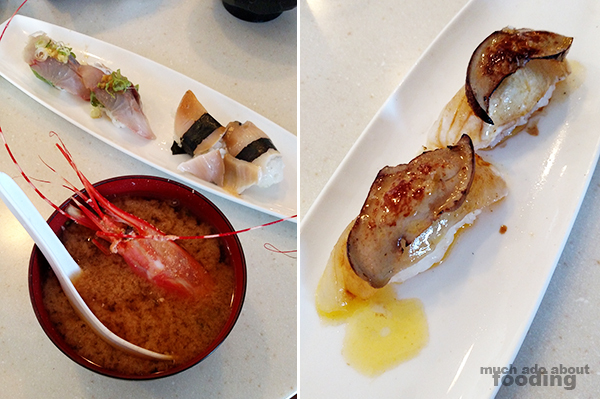 Seeing as Sushi Noguchi is steadfast on providing the choicest and freshest sushi they can, we were excited to dive into Chef Hiro's omakase once again. Chef Hiro always seems to have a knack for putting together creations that hearken to the rules of tradition but still manage to be genuine and show personality. We started with albacore that was joined by sticky yam in dashi with radish and nori strips, a great palate opener and use of unique ingredients. Uncommon fish followed throughout the meal such as sardine and mackerel but each piece was complemented by the right sauces or slight touch of wasabi to balance each one's individual flavor profile. 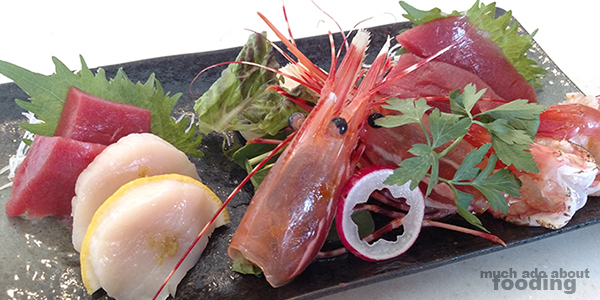 One of Chef Hiro's signature presentations involves two live shrimp ("dancing shrimp") on a rectangular plate (first photo in this post) alongside choice sashimi that usually includes shellfish. In the past, we've had it deep-fried but our enormous shrimp this time were presented kissed by the kitchen blowtorch but still very much raw. Afterward, our server asked if we wanted the heads deep-fried as a snack or poached in a bowl of miso soup - great choices either way! We greatly enjoyed the flavor it imparted into our soups. After this, we were glad to get bites of foie gras nigiri; the foie really melted everything together very well. However, our most treasured bite of the night was the remarkable way that Chef Hiro served up otoro (fatty tuna belly). 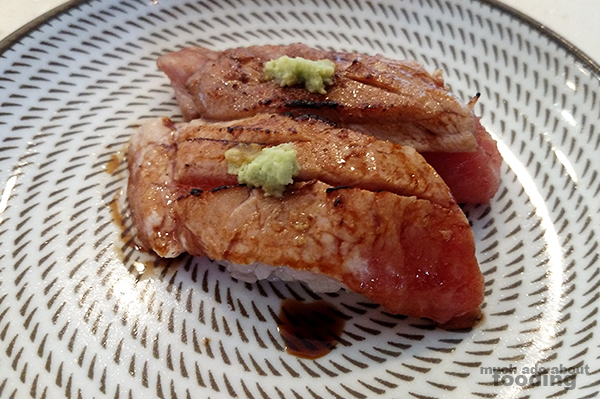 Instead of sashimi or unadorned nigiri, the otoro came as two pieces stacked atop one another. The raw half laid on its bed of rice, already rich and fatty in its own right, and was joined by the second otoro piece that had been seared with the kitchen blowtorch. The result? A fatty, savory slab of delicious otoro hitting your mouth first before being greeted by the cooler yet-still-as-fatty bit. It was amazing. 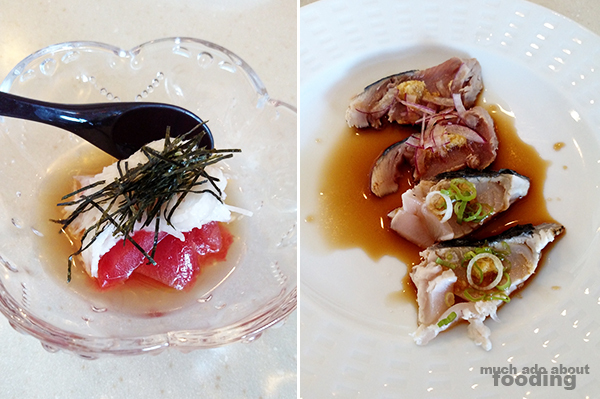 Of course, what post about Sushi Noguchi would this be without mentioning how extremely fresh and lovely their uni is? We truly enjoyed having bites of this and then rounding out the meal with their always-impressive mille feiulle dessert, a slice of cake composed of delicate, sweet crepe layers separated by airy cream. 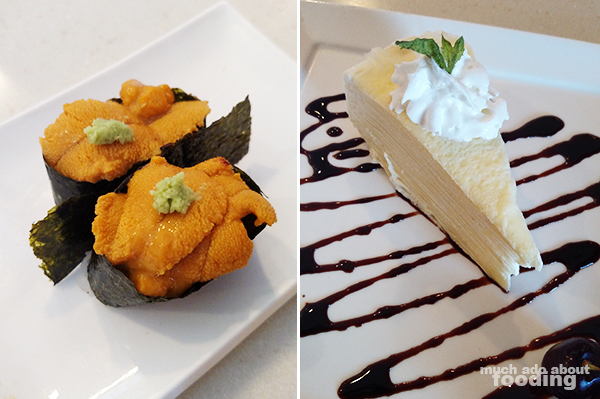 If any of this looks great to you, find Sushi Noguchi at 18507 Yorba Linda Blvd. Yorba Linda, CA 92886. We were delighted to see that their commitment to quality and their craft had not wavered over the years and that we, and many others, can continue to have worthy meals in this family-run establishment.